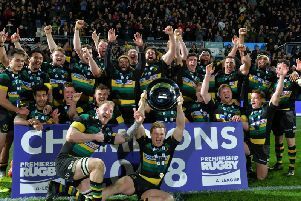 Jim Mallinder says everyone at Saints will take a long, hard look at themselves in the build-up to Saturday’s crucial Aviva Premiership game at Harlequins. Mallinder’s men produced a woeful performance last Friday night as they slipped to a 24-11 defeat to Wasps at Franklin’s Gardens. Saints conceded three times in the opening 30 minutes as they suffered their second home defeat of the season. They must now respond against Quins, with the gap between Saints and Conor O’Shea’s fourth-placed side currently 10 points. And Mallinder said: “We’ve had losses before, as every team does, and you really have to look at yourselves, and that’s everybody. “We’ve come back as well from defeats like that. “It was a better second half and we stepped it up in terms of our defence. “Maybe if we’d have scored at the end of that first half it would have been slightly different, but it wasn’t to be. “Wasps played really well, physically they got into us, their set piece was really, really good.